My first stop was Primi Piatti in the Waterfront on what felt like one of the hottest days this winter. We arrived at the restaurant hungry and after standing in line at a few other places was escorted almost immediately to a table. I think the hangry (hungry and angry) look on my face must have given away my need to sit down and stuff my face and their friendliness made it feel easier to deal with. I’m a huge foodie so the service is as important to me as the food. There’s nothing worse than feeling close to fainting and then having to be served by someone who looks like they have better things to do than deal with your growling tummy. Our waiter was friendly from the get go and when we couldn’t decide what exactly to order with our ribs (side effects of being hangry) he made suggestions for add ons that had everyone salivating at the mouth. We ordered the bigger portion with fries and man was it delish! It took roughly 15 mins for drinks and food to arrive! The ribs are served in 3 200g portions and we vacuumed them up in minutes. It’s pork ribs so not ideal for kosher or halaal and its also big enough for 1 person. It’s glazed with a cranberry sauce so its not too sticky and it’s also not too big a portion that you feel like you need to take a nap after lunch. It’s just the right consistency of sweet and spicy so for anyone looking for a classic taste, this would be it. Enjoy with a Mojito to complete the flavour and don’t forget to tip because they deserve it. My next stop was at Hudsons burger joint in Claremont. We walked in hungry as usual, but this time the service at the door or table seemed… blasé. Our order was the 800g ribs and unlike any other place this cow comes from a large family. Much to say this is beef ribs so safe for kosher and halaal. It’s definitely a man’s meal! I love the sauce they use to cook it in because even though it’s a sweet and sour vibe, it’s not over powering. The meat on this bone feels like proper meat and not the mushy kind: thick, but soft. 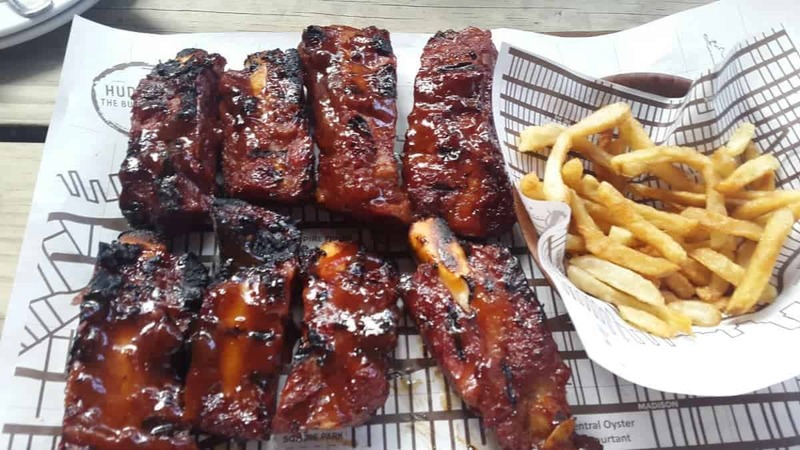 I have been a fan of their ribs from my very first visit to their Green Point branch simply because it feels like real people food (not diet types at all!) You really do feel like you get value for your money. I couldn’t finish mine because it was so filling and big and I would definitely recommend splitting it and adding on some crunchy chicken strips as a side if your 2 or more at the table. I went old school on this and had an ice cold Coke. If not for the almost unfriendly service, I’d give this place a 10. My final stop was a little more home grown… my kitchen. I popped into Woolies to get the ready made version of their beef ribs and I was not disappointed at all. It’s in a sticky sauce and you can get it in a box, take home, cook on 180° for about 15 mins and have an amazing meal. There’s enough for about 2 people or if you want to serve it at the table for guests as an add on at a dinner party then it’ll certainly make the table look a little fancier than with just a chicken pie on it. I loved that there was so much extra sauce in the bag that you could pour over to give it a bit of extra flavour during cooking and it was priced pretty close to regular restaurant ribs except it serves 2 and you never have to worry about a tip or bad service. Good food is hard to come by at a good price so here’s to hoping these babies don’t change. Bon appetite! We’re always trying out new places – but don’t always get round to posting about the meals we have. If you’d like to know what we think of a specific place, please let us know and we’ll add it! In the meantime, you might like to read about our time at Gabrielskloof Restaurant.